Should you capitalize or not? When it comes to determining the cost of your assets, most standards ask to include all directly attributable items. What about interest and other borrowing costs? Did you know that if you have 10 dollars in your pocket and no debt, then you are wealthier than 25% of all Americans? Trust me – the corporate scene is no different! Well, let’s be honest, borrowing money does carry a cost, and sometimes very significant one. Here, I’m not talking about the loss of your friends or even family members, but all these quantifiable items such as interest and similar cost. As these are often directly attributable to the acquisition of assets, they should be capitalized. You could capitalize eligible borrowing costs. Unfortunately, this choice was removed a few years ago for most of assets, and now you have to capitalize. In this article, I tried to draft a few basic rules about capitalizing borrowing costs and also, I reply to 3 most common questions received from you. Let’s talk basics: What does IAS 23 Borrowing Costs say? The core principle of IAS 23 Borrowing Costs is that you should capitalize borrowing costs if they are directly attributable to the acquisition, construction or production of a qualifying asset. Other borrowing costs are expensed in profit or loss. Qualifying assets are assets that take a substantial period of time to get ready for their intended use or sale. Note here that IAS 23 does not say it must necessarily be an item of a property, plant and equipment under IAS 16. It can also include some inventories or intangibles, too! But what is a “substantial period of time”? Well, that’s not defined in IAS 23, so here you need to apply some judgment. Normally, if an asset takes more than 1 year to be ready, then it would be qualifying. Exchange differences on borrowings in foreign currencies, but only those representing the adjustment to interest costs. Gains or losses arising from early repayment of borrowings, etc. Here again, we need to apply our knowledge from other IFRS standards and sometimes, make a judgment, too. IAS 23 differentiates between capitalizing borrowing costs on general borrowings and specific borrowings. You simply capitalize the actual costs incurred less any income earned on the temporary investment of such borrowings. On 1st May 20X1, DEF took a loan of CU 1 000 000 from a bank at the annual interest rate of 5%. The purpose of this loan was to finance a construction of a production hall. The construction started on 1 June 20X1. DEF temporarily invested CU 800 000 borrowed money during the months of June and July 20X1 at the rate of 2% p.a. What borrowing cost can be capitalized in 20X1? (Assume all interest was paid). Although the funds were withdrawn on 1st May, the capitalization can start only on 1st June 20X1 when all criteria were met (the construction had not started until 1st June). Note: this is very simplified calculation and if the loan is repayable in installments, then you need to take the real interest incurred (by the effective interest method). Just don’t forget that the borrowing cost in May 20X1 is expensed in profit or loss, as the capitalization criteria were not met in that period. Now, there’s more trouble with capitalizing general borrowings, as you need to prepare a bit more calculations. General borrowings are those funds that are obtained for various purposes and they are used (apart from these other purposes) also for the acquisition of a qualifying asset. In this case, you need to apply so-called capitalization rate to the borrowing funds on that asset, calculated as the weighted average of the borrowing costs applicable to general pool. To illustrate it, let me give you an example about capitalizing borrowing costs on general borrowings. The bank loan at 6% p.a. was taken in July 20X1 to finance the construction of a new production hall (construction began on 1 March 20X1). The bank loan at 8% p.a. and debenture stock were taken for no specific purpose and KLM used them to finance general spending and the construction of a new machinery. KLM used CU 60 000 for the construction of the machinery on 1 February 20X1 and CU 25 000 on 1 September 20X1. What borrowing cost should be capitalized for the new machinery? You ignore bank loan at 6% p.a., because it is a specific borrowing for another asset. Borrowing costs for the new machinery in 20X1 = CU 60 000 x 7.31% x 11/12 + CU 25 000 x 7.31% x 4/12 = CU 4 021 + CU 609 = CU 4 630. After we know the basics, let me give you my opinion on 3 the most common and often questions I get in relation to capitalizing borrowing cost. I receive these questions quite often, so let me shed some light there. Question #1: Can you capitalize interest cost in the cost of inventories? In most cases, inventories do not take a substantial period to get ready and in this case no, you cannot capitalize. Large items of equipment, such as aircraft, ships etc. In this case, you can capitalize borrowing cost, but it’s up to you if you will or won’t. While you have no choice for PPE (you have to capitalize), you have a choice for inventories: either you capitalize, or expense in profit or loss. Question #2: Can you capitalize foreign exchange loss on specifically borrowed money in a foreign currency? No, you cannot do it fully. Yes, IAS 23 says that exchange differences on foreign currency borrowings are a borrowing cost to the extent that they are regarded as an adjustment of interest cost. Simply speaking – you can capitalize the difference between the interest on the foreign currency loan and the hypothetical interest expense in your own (functional currency), because that’s regarded as borrowing cost. The rest must be expensed in profit or loss. 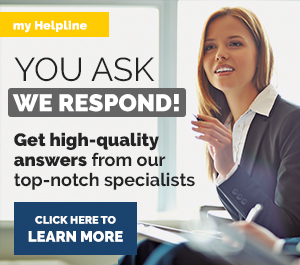 Question #3: Can you capitalize interest cost on intercompany loan for qualifying assets? Yes, in the separate financial statements of the borrowing company. However, be a bit careful about the consolidated financial statements, because based on the intercompany relationship (subsidiary or associate? ), the intercompany loan might be eliminated. Also, let me point out one more issue in relation to intercompany loans: often, they are provided interest-free. Under IFRS 9, you should recognize almost all financial instruments at their fair value (sometimes plus transaction cost) and if a subsidiary gets an interest-free loan from a parent, it’s nominal amount is not at fair value. Therefore, a subsidiary needs to set the fair value of the loan received using the market interest rates and book the difference between the loan’s fair value and the cash received in profit or loss (based on the substance of a transaction). Then, interest expense calculated by the effective interest method is capitalized. I know, this might sound odd: the loan is interest-free, but you still need to capitalize some borrowing cost on it. Careful! Do you face any other issues with the borrowing cost? Please leave a comment below and share this article with your friends. Thanks! I work in a Bank. I would like to solve an accounting issue. We have revalued all our land and Building in 2012. Now this year, we have started the operation of a new branch. So this new branch has land area 7500sq and out of which 1158sq is building area. My question is we have debit all the costs to make this building in our work in progress account. So should i reverse this WIP account and capitalize the amount to Building directly? My understandng about IAS 16 was if revaluation model is used in one class then entire assets of that class should be taken as revaluation model. Sorry, Asma, I don’t understand your question. You have started the operation – meaning that the new branch is in a revalued building? Or you have started a construction? Why do you have WIP? Please clarify as I’m lost in your question. S.
When we can capitalize the financial lease loan interest amount. My question is as below. 2, When the actual interest payment happening. Hi, you should capitalise interest when it is incurred. In fact, you also need to meet 3 conditions for capitalising interest under IAS 23. S.
I must commend you on your time and effort to increase IFRS knowledge around the world. A quick one Sylvia, can you briefly differentiate cost incurred from cost accrued. My understanding is that the term “incurred” originates from the “accrual concept” as cost is incurred “when a party becomes liable”. Thank you Silvia,Could you please elaborate more on the question # 3 i.e., interest free inter company loan, how to set its fair value with example? Hmmm, I see that this question comes up. As I have answered here already – exactly this example is covered in the IFRS Kit, but maybe I will elaborate some example in the separate article. S.
I have obtained loan form BANK 250,000 @ 3% ON 01-07-2014 for a six month and paid on 31-12-2014. and i have obtained other loan 400,000 at 01-01-2015 @ 4% interest for three month 31-03-2015 and paid. on 01-04-2015 i have obtained other loan 500,000 @ 7% for six month. these are general borrowing . please calculated the borrowing cost and capitalized rate. it seems that you had only 1 loan at a time – so the capitalization rate is simply an interest rate on that loan. You can calculate borrowing cost based on the amount you actually spent on a qualified asset. Just be careful, as the borrowing cost needs to be on actual incurred (paid) expenditures, not just accrued. S.
May I know the double entries for this adjustment both initally and in the subsequent year? 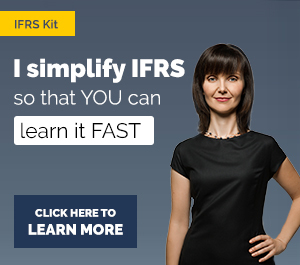 if you are subscribed to the IFRS Kit, this example is solved there step by step. I can’t really cover it in the comments, as there’s not enough room 🙂 S.
Please, how can we subscribe to the IFRS kit? You can register online on this page. S.
I work in the Accounting and Auditing Board. Recently, we have received a query from a Small & Medium Enterprise company stating that their borrowing costs are substantial for specific purpose and wanted to capitalize it. Since IFRS for SMEs doesn’t allow the borrowing costs to be capitalized, can this SME be allowed to capitalize the borrowing cost? If allowed, it will tantamount to allowing SMEs to cherry-pick some standards from full IFRS and some from IFRS for SMEs. If not allowed, charging subtantial boowing costs to P/L account will have huge implications to the firm. Any advice is appreciated. if a company is applying IFRS for SMEs, then it should not capitalise borrowing cost as in this case, the financial statements are not fully compliant with IFRS for SMEs. 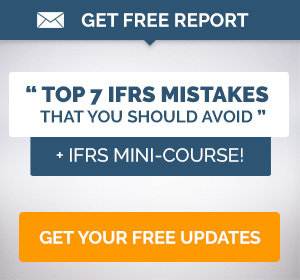 It’s not really permitted to pick something from full IFRS and something from IFRS for SMEs. However, let me say here, that maybe in this case, it would be OK for the company to apply the full IFRS. Maybe other differences between IFRS for SMEs and IFRS applicable for this particular company are not that significant and the company would be able to capitalise borrowing cost. S.
Thank you so much for clarifying the borrowing cost this information is very helpful as im writing my exam on specific financial reporting next week. Great elaboration of this cost. Thank you so much!! Very insightful, Thanks you very much. Silvia. When a company borrows money thru buyers credit in Foreign currency , the restatemennt gain / loss is not allowed to be capitlaised, but the interest that woould have beeb incurrened in fucntional currency less the interest on the actual borrowing in FC, can be capitalised as per IAS 23.
my simple question is : is the period to be considered for capitalisation of interest cost is from the date of loan till date of replayment of the loan or only till the capitalisation ? the capitalisation should stop when you complete substantially all activities to prepare the asset for its intended use or sale. It means that while you still construct the asset, you capitalise incurred interest cost and when the loan is repaid, then there will be no more interest cost to capitalise. S.
Can we capitalize the borrowing cost for the asset acquired? do you mean “for the asset acquired by purchase?” Well, I don’t think so, because an asset must be qualifying – by definition, it must take a substantial period to get ready for the intended use or sale – and if you purchase the asset, then it’s not a substantial period, is it? This actually happens quite frequently. It could take 3 months to transport and assemble a system of equipment. Suppose the company borrow money to specifically fund the acquisition of the system. Since 3 months are commonly considered not “substantial”, does this mean we CANNOT capitalize the borrowing costs? Note that the standard states that borrowing costs MUST be capitalized if the asset is a qualifying one. But it isn’t clear if we MUST expense borrowing costs if the asset is not a qualifying one, especially in situation where the fund is used to specifically fund the acquisition of the asset. You are the best Sylvia. Trust me, your explanation is so much simple that I sometimes find myself asking whether it’s accounting am seeing on your website. You make it very simple and easy to use. Thanks so much. Thank you for the explanation of IAS 23. I very keenly follow your articles and often refer to them when I need some clarification. Moreover, I have a question if you don’t mind, can you explain the Question 2 in detail please as I was not quite able to follow the same. Thanks for all the Help and contributions to our world of accounting!!!! Hi Silvia, what about costs of obtaining the borrowing? Can you capitalise it? Hi Cynthia, usually, cost of obtaining the borrowing – like some initial fees etc. are incorporated into the effective interest method and the effective interest rate changes as a result. In other words – they are neither straightly capitalized nor expensed in P/L, but instead, the loan accounting is altered to implement the effective interest method. S.
I would appreciate if you could elaborate further with examples on other borrowing costs like processing fee for loan. How to account them. For specific borrowing do we calaculate interest based on the loan drawdowns on the asset or on the total loan amount. For instance if loan is for $1m and only $200k is the expenditure actually incurred. Is capitalised interest based on $1m or $200k for the specific loan? The interest should be capitalised proportionately in terms of the portion actually utilised to acquire the asset. Note that if part of the loan is invested the total interest should be reduced by the investment income before any capitalisation considerations. Hi there, quick question on arrangement fees associated with debt taken out to purchase/invest in a subsidiary – can this arrangement fee be capitalized in line with IAS 23 (I believe it can but am not sure!). Dear Michelle, arrangement fees associated with debt should be treated as a part of cash flows in the application of the effective interest method. It means – no, the fee itself is cannot be capitalized as such, but you should take it into account in the amortized cost calculation. In order words, your effective interest rate needs to count with an arrangement fee and your effective interest (capitalized or not) would be adjusted by the arrangement fee, too. S.
Thanks for clarifying on the treatment of arrangement fee. As I understand from your comment, arrangement fee incurred for obtaining loans can be amortised but not capitalised to qualifying assets. Would you please enlighten me with the treatment of non-utilisation fee on loan facilities obtained for financing qualifying assets? Should this get written off immediately or can it be capitalised to the qualifying asset? Hey, I am a student studying the accounting standards. Do you know any place from where i can practise questions related to IAS 23? Respected Madam. My Question is that i have obtained 3 tyoes of Loan form BANK 1st @ 3% of Rs.500,000/- from 01-07-2014 to paid Rs. 200,000/- on 31-12-2015 Remaing Rs.300,000/- un paid on 30-06-2015, 2nd Typs of Loan is Rs.100,000/-@ 5% is obtained from bank 01-07-2014 and paid on 31-may-2015. and 3rd obtain from bank 01-7-2015 is Rs.400000/ @ 6% Still un paid on 30-06-2015.All these borrowing are General BOrrowing and used for both i.e qualified assets and other . waht would be the capitalized rate. I would like Silvia to comment on the understanding. Does the interest charges incurred on Hire Purchase of a vehicle constitute as borrowing cost and therefore can this be capitalized? You cannot capitalize the foreign exchange gain/loss on the liability (loan) itself, because that’s NOT a borrowing cost. You need to realize here, that your loan is a financial liability that must be subsequently measured under IAS 39/IFRS 9.
can you please tell the accounting treatment of the income earned by the investment of idle funds in specific borrowing. Would it be treated in the P&L? should the Company capitalize appraisal fee, and commitment fee related to EBRD loan? these fees are origination fees, so you should adjust cash flows from your loan. In other words, you take these fees into account when deriving amortized cost (assuming you measure your loan at amortized cost). S.
Thank u Silvia.M for ur detailed description.. Thank you for the explanations and comments which are very useful. Just a short question. A general borrowing agreement specifically prohibits spending money on capital expenditure and a bank approves a list of bills to be paid. List would consist of working capital items only. In this case can a company argue that interest on general borrowing will not be capitalised as a part of qualifying asset? Or this argument contradicts with substance over form principle? Hi, in the case of real estate project which are basically into Mall and office premise construction and later on they put mall and office spaces on rent. For the purpose of construction, major cost goes towards buying land and also it takes substantial time to start construction after land purchase. My question is whether it is allowed to capitalize interest cost on acquisition of land which obviously forms part of Mall after construction. If yes, in local GAAP in India, land forms part of separate asset in the fixed asset register, whether answer will change. if the land forms a part of a development project and requires significant landscaping and adjustments, then I think it would be possible to justify the capitalization. S.
Dear Silvia, thank you for your efforts! It’s a realy very useful site! Situation: there is some fixed assets which already installed and operated. Expensive modernisation of that fixed asset is to be started. Modernisation will be continued more than one year. Fixed asset will be used during modernisation. At your opinion, is the modernisation a qualifying assets? this is a very interesting question and I must say that there was a lot of discussion around capitalizing borrowing cost on renovations. IAS 23 defines qualifying asset as an asset that takes a substantial period of time to get ready for its intended use or sale. However, you mentioned that your fixed asset will be in use during the modernisation and therefore, it has already been ready for its use/sale and it does NOT qualify for capitalization of borrowing costs. However, if your asset would be put out of operation during the modernization and modernization would change its use (purpose, functionality, capacity, whatever), then these costs could be capitalized as the asset would be qualifying. I have a question with regard to a loan obtained specifically to finance both the acquisition of land and construction of a building on that land. Can the interest (during the construction period) on the entire loan be capitalized? Or do I have to allocate how much is attributable to the purchase of the land and how much is attributable to the construction of the building and subsequently only capitalize the interest on the portion attributable to the construction? Hi Silvia…How can we differntiate general borrowings from specific borrowings because in some cases its really confusing with each other…. First of all thanks for such a nice article. I have a small query. See normally intercompany loans doest not specify the term for which they are given. So how to calculate fair value in this case? That should be the best estimate, with reassessment each year. S.
We have a loan in a foreign currency loan which is being utilized to construct a property (which will be leased). There was a recent devaluation in the currency and we not hav a huge unrealised forex loss. Can we capitalize this forex loss or should i be expensed? well, FX loss on a loan can be capitalize to the extent that this loss is regarded as an adjustment to interest costs. Please see the article above. S.
Great! Very grateful to you. a loan obtain for the purpose of purchase a land and construction a mall on it. first withdraw is for purchasing the land and second after the permission of building is obtained. the obtaining the building permission and designing normally takes 1 year. During this period, interest incurred, and purchased and is incurred and activities for getting the asset ready is being processed like design and government permission. therefore, in this case the land is a qualified asset as it is not ready for its intended use and the activities for getting the asset ready is being processed, the interest on purchasing the land can be capitalized? Hi Silvia, I’ve got a question: is it possible to add implied cost of carry (cost of holding cash) to the capitalised rate? For example at my work our cap. int. rate is based on Gross amounts – so we offset Borrowings by derivatives amount and calculate the rate as Gross Borrowing costs/Gross Debt, which results in say 5%. I was wondering if we could base this calculation on a net basis – we would offset Borrowings by derivatives as well as cash and calculate the rate as Net Borrowing costs/Net Debt. If I do that the rate increases by about 0.30-0.50%. what specifically is a cost of holding cash? Unless it is some adjustment to the interest paid to a bank, then I doubt it is considered a borrowing cost at all. For me it seems that it is not a cost of obtaining financing; rather it is a “storage” cost and therefore, I doubt it meets the definition of borrowing costs under IAS 23. I think holding cost is similar to commitment or non-utilization fee paid to the bank on the remaining loan balance and the borrow will continue to pay it until the full loan facility is used up. This sort of loan facility is usually arranged for long term projects with uncertain cash flow forecast. I don’t understand why such payments on specific borrowings do get capitalized to qualifying assets. I’ve just noted I did not respond to one of your questions above. As for the non-utilization fee or holding cost: I think it would be hard and quite aggressive to state that these are borrowing costs, because they arose due to non-investing the cash into the acquisition of qualifying assets and not due to investing, isn’t it? It is unlikely that these costs are directly attributable to the construction of an asset as they arose due to holding cash, and not due to construction. So no, I would not capitalize these payments. S.
I was reading questions and responses on the non utilisation fees (i.e. commitment fees)and origination fees. In case we have a real estate asset (payment is deferred)and also have an arrangement with the bank to get a loan at the later time (when the payment will be due) and for the non-utilisation period we are paying a commitment fee. Shall we show an arrangement fee and a commitment fee as prepayment until the loan will be drawdown and on this event there will be a reclass from prepayment to loan. As the real estate will be under development and loan will be at amortised cost, shall we show amortisation of arrangement and commitment fee separately from the “interest” as only the latter will be capitalised into asset? I have really learnt a lot from all these interactions… thanks everyone for sharing your experiences. the arrangement fee needs to be treated as a part of the effective interest method under IFRS 9 (it means that your actual interest rate would be different from what you have in your contract, because you need to count with all cash flows from the loan). In fact, you can capitalize the borrowing cost related to the land acquisition IF you are developing this land – i.e. you can capitalize these costs only during the period when the land is being developed. But, if you buy the land with the loan and you hold it for future development – then no, you cannot capitalize the costs during the holding period. S.
How to deal with repayment of loan in capitalization of interest. Is it assumed that due to repayment of installments interest cost will get reduced? 1- if we sold all units, what we have to do with the upcoming interest expenses. 2- if partially sold and we transfer the WIP to inventory. Hi Mohammed, if the construction ceases, then you should stop capitalizing borrowing cost. Therefore, you should expense the borrowing cost for your 2 cases. S.
Mohamad, you should capitalize in 2016 if all conditions are met. S.
1) I need some guidance on accounting for break costs (breaking costs associated with refinancing a loan or restructuring. 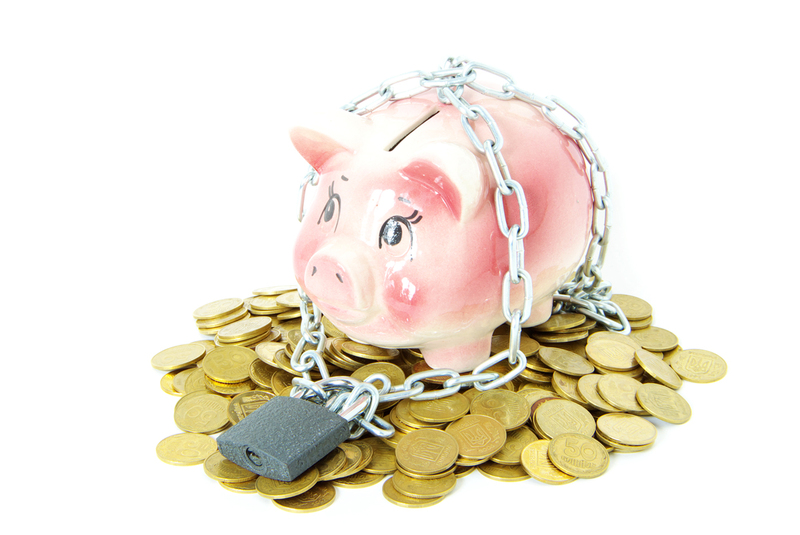 Which accounting standard should I look as it not captured in AASB 123? 2) If the break costs are inherent in the interest rate swap (i.e. we terminate the existing swaps and get a new one and the bank uplifts the rate). Is there any specific way to account for this ? I have a question. Should borrowing Cost be capitalized upto test Run Production Date or the Date of the Final Production when final commercial operations are started? For Example a qualifying asset starts Trial Run Production on March 16, 2017 but final commercial Operations Date when independent Engineer gives completion certificate is May 31, 207. By What date Borrowing Cost should be capitalized i.e March 16, 2017 or May 31, 2017. Just pondering if the Principal Repayment portion of the borrowed cost should be capitalized as well? No. Instead, it decreases your liability from loans. Hey Silvia, iam thankful for this wonderful innovation. 10% four year note with simple interest payable annually, which relates specifically to the project; debt outstanding at 31 May 2017 amounted to $2.52 billion. Interest of $234 million was incurred on these borrowings during the year and interest income of $72 million was earned on these funds while they were held in anticipation of payments. 12.5% ten year note with simple interest payable annually; debt. Outstanding at 1 June 2014 amounted to $5.4 billion and remained unchanged during the year. 10% ten year note with simple interest payable annually; debt outstanding at 1 June 2014 amounted to $5.4 billion and remained unchanged during the year. 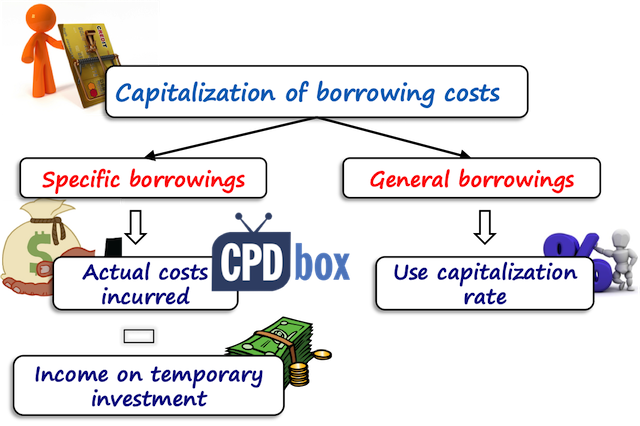 Determine the amount of borrowings costs eligible for capitalisation. Not really home work. I just came across it. Am stuck on how to arrive at the weighted general borrowings outstanding. What approach can I use to arrive at this. Thanks, I will be glad. For those qualifying assets that take more than one year, how can we determine the outstanding period for the amounts allocated to general borrowings? Here are some hyperlinks to internet sites that we link to simply because we feel they may be worth visiting. Capitalize, if it is a removal of obstacles for building a new building. Don’t die, please :)Good luck! Can those upfont fees & structure fees on bank loan (say 1% on total borrowings) for the purpose of investment in subsidiaries be capitalised? Or can we recognise on the balance sheet & amortise it over the loan period instead of immediate hit to income statement? please let me know can i capitalized the interest as well. and what is the accounting treatment as per standard. you can just capitalize the interest on the borrowings incurred – in your case, capitalize just 10% on 5 million. S.
I just want to clarify something on capitalization, for example land(intended for subdivision/condo) is purchased via bank loan, can i capitalize the whole interest or just the portion of interest until property is ready for resale? usually companies do not capitalize the interest for the acquisition of the land – the reason is that the land itself is not a qualifying asset. The asset must take substantial time to complete – which is not the case for the land. S.
Hi Silivia .. Do we consider impact of interest income on WIP in case of general borrowings ?? If yes , How to Calculate ? Asset is still incomplete ..
Dear Mir, in the case of general borrowings, you do not calculate temporary interest income. You simply capitalize interest based on the capitalization rate. If the loan is specific, only then you calculate the temporary investment income. S.
It is getting very useful to read your articles. I have a question to you. When I tryied a question about IAS23, there was not any information about general borrowing. There was only specific borrowing and it is not enough to cover payments average accumulated expenditure on qualifying asset. What should I do to solve this question to find borrowing cost? On 1 January 2016, HP LLP, raised funds, specifically to finance the construction of a new factory, a qualifying asset as per IAS 23, in the amount of $10,000,000 from a bank at interest rate of 8% per annum for 10 years. The entity commenced construction on 1 February 2016 and incurred expenditure of $3,500,000 at the first of each month from February to November 2016, except for September and October 2016, when the entity suspended the construction for two months due to labor strikes and shortage of materials. The building was completed and ready for use on 30 November 2016. The proceeds from specific borrowing were temporarily invested in March 2016 and generated interest income of $18,000. Calculate the net borrowing cost that shall be capitalized as part of the cost of the new building and the net finance cost that shall be reported in the statement of profit or loss for the year ended 31 December 2016 (show journal entries). Just wondering, how do we capitalised the undrawn borrowings cost. Like if we have 100 million loan facility, drawn 20 million at this year, and the borrowing cost is 2 million for the whole facility, and current drawn down is 200k facility, should we just capitalize 2.2 million, or do we need to allocate the 2 million to undrawn borrowings and capitalise later? If you refinance a mortgage loan, can we write-off the previously capitalized origination loan fees and set-up all the direct costs related to the refinanced mortgage loan? Hi Veronica, if you measure your loans at amortized cost, then let the origination fees are incorporated within the effective interest method and they will stay there over the loan’s life. However I assume here that the exchange of debt (refinancing) is not under the terms substantially different from the original mortgage loan – if yes, then you derecognize the old loan and recognize the new loan. S.
Great Job. I recommend your site to everyone. One quick question. Can we capitalize borrowing costs on land acquired to construct PPE. The PPE shall take 3 years time to complete. So borrowing costs on PPE are capitalized on lets say the building, but what about the borrowing costs on the land. I would like to ask you if we obtain a loan and interest is payable during the period of construction, should we add interest to Weighted Average Accumulated Expenditure. I would like to ask you when the investment income is more than the borrowing cost, how to treat it? Reduce the value of an asset or recognize it to income. My question is regarding interest charged by related party @ 5% on payments made on our behalf to vendors for constructing chemical plants with 3 phases. One part completed and commissioned in November 2015 .Last payment made in Jan 2016 for that plant. Remaining two as of 31st Dec 2017 are CWIP. They charge interest on closing balances on year end till Dec 2016. However, start charging interest on monthly basis afterwards till to date. How much interest we can capitalised and expense out as per IAS 23 considering last payments for plants CWIP made in 2016. Afterwards interest charges are on accumulated balances pilling up every month. My question is regarding when should we pause or terminate the Capitalization of interest cost. My company is construction a warehouse for renting purposes though the construction is not complete yet we have rented the part which is ready and I look a Long Term Loan to construct the warehouse. Also Warehouse is still 90% complete and construction is still on ,should i recognize it as asset because Warehouse is generating Income. This is first project of my company and I am not making any Income Statement for my company because it is still in capitalization phase. Hi Silvia, in Colombia (South America) there is a bank debit tax, altough it is not specifically included in IAS 23 it is possible to include it as borrowing cost? having in mind the incremental cost principle; the company would not have incurred in that tax expense related to the loan to real estate development. Hi Edgar, yes I think so. IAS 23 does not prohibit the classification of costs other than those listed as borrowing costs. In this case, the basic criterion is met – bank debit tax is directly attributable to the acquisition, construction or production of qualifying asset, because the company would not have incurred this tax without these activities. S.
Hi Silvia. It is very interesting and useful site. Hi Asef, thank you! Actually, I have already covered this topic with example here. S.
Your work is really helpful – I was just wondering how capitalising the interest of an asset would appear in the P and L account and Balance sheet compared to if it wasn’t capitalised under a different standard? I’m specifically looking at FRS 105 for micro-entities where capitalisation is not permitted? Would this have an effect on profits and different ratios? Please do we less any investment income in relation to general pool of loans to get the eligible borrowing cost to be capitalized? How I can depreciate capitalised asset over the useful life of asset? How to treat interest costs which added on fixed assets anually in accounting records? For example, Asset $ 100,000+$ 2000 (interest expense) for 2017. $ 3500 interest expense for 2018. Can I capitalize the processing fees (upfront processing fee ) of (say for eg 1% of the loan amount) as borrowing cost under IAS 23. Please note that the processing fees was included as a part of the borrowing (Eg 10 Million loan+ 1 million Processing fees) repayable over a period of 10 years. This article were really helpful during the course of my work it may just be the best elaboration of the standard. However i just wanna confirm on one issue regarding inter-company loan. If my company got a loan from the parent entity which happens to be not interest free, should i capitalized the borrowing cost/ incurred interest as part of the qualifying asset? or should it be expense as incurred as the interest expense would be eliminated at a consolidation level. strictly speaking – if a subsidiary presents individual, separate financial statements under IFRS, the interest (if conditions are met) has to be capitalized, there is no option to expense it. Upon consolidation, this would be eliminated – which means that yes, the cost of an asset in question will be different in consolidated statements from individual subsidiary’s statements. S.
I am currently facing a dilemma where by my company(parent) obtained a loan from its subsidiary which is a bank and we capitalised the interest expense. Now am trying to consolidate the financial statements for both the parent and the bank but I do not know how to make the necessary adjustment. I have explained it in some other answer here – you need to remove all entries related to that loan since the loan has not happened from the point of external users. Thus, the cost of an asset will be different in consolidated financial statements from the cost in individual parent’s statements. S.
Can loan processing/structuring fees be capitalised over and above the interest to the cost of a building under construction? Thank you for all the great articles. I have a question, we obtained a loan “specific finance” for the construction of an asset. However meeting all requirements for the loan per the loan agreement has resulted in us incurring some legal costs – will these legal costs be regarded as an initial cost and hence be capitalised to the cost of an asset as a borrowing cost? I guess that legal cost was directly attributable to obtaining of the loan and therefore it is a part of the effective interest method when it comes to measurement of your loan. If this is so, then you should capitalize the interest incurred as calculated by the effective interest method. Capitalized interest costs arising from intercompany loan are depreciated over useful life of assets in subsidiary’s financial statements. Should the depreciation charges be eliminated upon consolidation? Yes, at least the portion of depreciation related to capitalized interest cost.